Wakatipu Anglers Club is based in Queenstown and meets on the first Tuesday of each month at the World Bar at 7:30pm. Meet in the bar a little before the meeting with other club members for a drink and maybe a meal if you like. Established for over 30 years (established 1986), the membership boasts some of Queenstown's most recognised fly-fishing enthusiasts and welcomes all anglers to enjoy sociable club nights, trout chasing expeditions and a shared passion for the outdoors. Home waters encompass the lakes and rivers scattered throughout the Wakatipu basin, offering some of the best freshwater fisheries in the world. With gin clear waters, the stunning backdrop of the Southern Alps and fish that can easily exceed ten pounds, adventure is only limited by your imagination. The club holds regular trips, competitions, and a beginners' fly fishing course which is held annually in October providing the public an opportunity to be mentored by some of the regions top anglers. Member resources include a club hut situated on the banks of Diamond Creek just north of Glenorchy and use of the club boat which has a newly mounted electric motor on the bow. 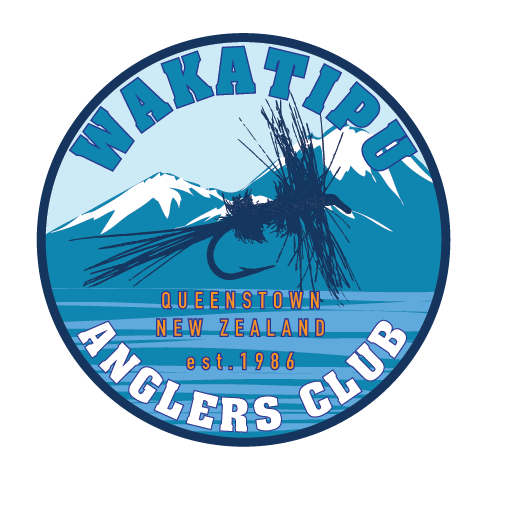 Wakatipu Anglers Club always welcomes new members so if you are interested in finding out more or becoming part of the local fishing community feel free to get in touch or come along to one of the club meeting to get to know us. "Adventure, it's in our blood"